You don’t have to be a star athlete to participate in the ziplines at CLIMB Works! In fact, nearly everyone can participate in this fun activity that is sure to be a highlight of your vacation in the Smoky Mountains! You only need to be at least 7 years old to join in on the action and participants that are at least 15 years old can zipline without having an adult accompany them on the tour! The only weight limitations are a maximum of 270 pounds for heights 5’10” and 250 pounds for heights under 5’10”, while the height requirement is a maximum of 6’8”. Another surprising thing that you might not know about our ziplines in Gatlinburg TN is that they operate rain or shine! In fact, a rainy day can be one of the best times to experience our ziplines as that is when the Smoky Mountain ecosystem really comes alive! We do have ponchos available upon request for those who prefer not to get soaked. Of course, we do not operate in extreme weather conditions such as thunderstorms or extremely high winds for the safety of our guides and guests. If you want to capture some incredible footage of your zipline experience, you will be delighted to know that cameras are permitted on the ziplines at CLIMB Works! We do request that the camera is securely attached with a strap for the safety of those working or traveling under our zip lines and platforms. There is no need to worry if you don’t have your own camera because we will take professional photos of you and your fellow participants during the most scenic parts of the tour! You can view and purchase these photos immediately following the tour. If you are concerned that the starting point of our ziplines requires a long, steep walk up a mountain, you can relax knowing that we provide a lift to the top! 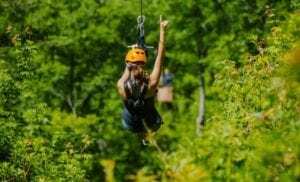 Both of our zipline tours, the Treetop Zipline Tour and the Mountaintop Zipline Tour, start with an ATV ride that takes 6 passengers up the mountainside. During this journey, you will gain 400 vertical feet over a half mile! One of the things that makes folks the most nervous about ziplining is the braking element at the end of each zipline. The awesome news is that CLIMB Works uses the best system in zipline braking, which is called the ZIPKEA. This system automatically determines the pressure required to slow you down so that you never have to worry about braking on our ziplines in Gatlinburg TN! Now that you know some of the surprising details about our ziplines in Gatlinburg TN, learn more about experiencing our world class zipline tours! We hope to see you soon at CLIMB Works!